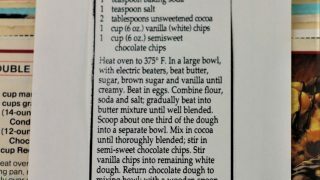 Front of the recipe card for Marbled Chocolate Chip Cookies. 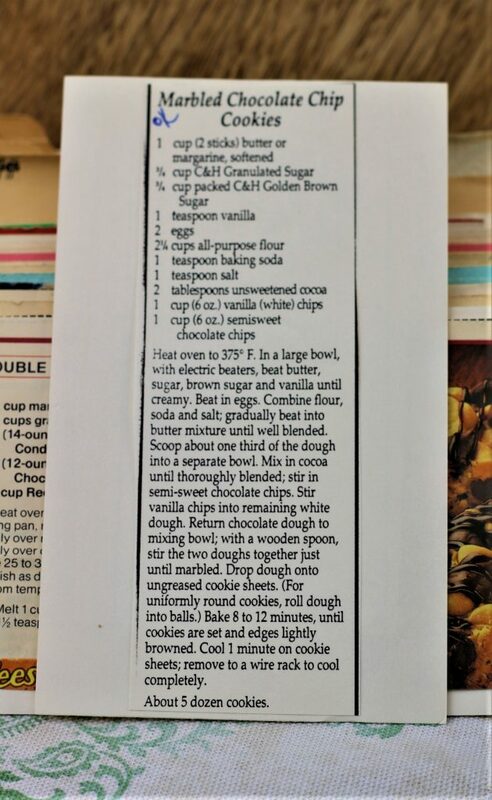 There are lots of fun recipes to read in the box this recipe for Marbled Chocolate Chip Cookies was with. Use the links below to view other recipes similar to this Marbled Chocolate Chip Cookies recipe. If you make this Marbled Chocolate Chip Cookies recipe, please share your photos and comments below! Heat oven to 375°F. In a large bowl, with electric beaters, beat butter, sugar, brown sugar and vanilla until creamy. Combine flour, soda and salt; gradually beat into butter mixture until well blended. Scoop about one third of the dough into a separate bowl. Mix in cocoa until thoroughly blended; stir in semi-sweet chocolate chips. Stir vanilla chips into remaining white dough. Return chocolate dough to mixing bowl; with a wooden spoon, stir the two doughts together just until marbled. Bake 8 to 12 minutes, until cookies are set and edges lightly browned. Cool 1 minute on cookie sheets; remove to a wire rack to cool completely.